Goodrich Man Charged with Arson, LIVINGSTON, December 5, 2014 - The Polk County Sheriff’s Office has filed a criminal charge of Arson with intent to Damage or Destroy a Habitation against Ervin Demond Harrell, 35, of Goodrich. The charge is the result of a thorough investigation of a house fire on Rayon Rd that occurred on November 17, 2014. According to Sheriff Hammack, detectives interviewed and received information from several witnesses. Detectives were assisted by the State Fire Marshall’s Office which resulted in a very thorough investigation of the crime scene. Sheriff Hammack stated that on November 19, 2014 Harrell was arrested in San Jacinto County on two warrants stemming from the disturbance on the day that the fire occurred. 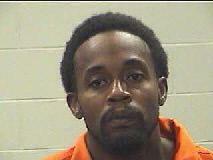 He was charged with injury to a child and assault causing bodily Injury to a family member. There was also an outstanding probation violation warrant out of the Polk County 411th District Court. The warrant for the Arson was served on Harrell at the Polk County Jail on December 3, 2014. Bond was set at $50,000.00. According to witnesses, Harrell was having a domestic dispute and threatened to burn down this mobile home (owned by his girlfriend), moments later, the place was on fire.